Monday, June 15, 2015 was a newsworthy day in the town of Willow, Alaska, about a two hour drive north of Anchorage. The nearby wildfire, known as the Sockeye Fire to forestry and firefighting personnel, had grown alarmingly fast in just a day. 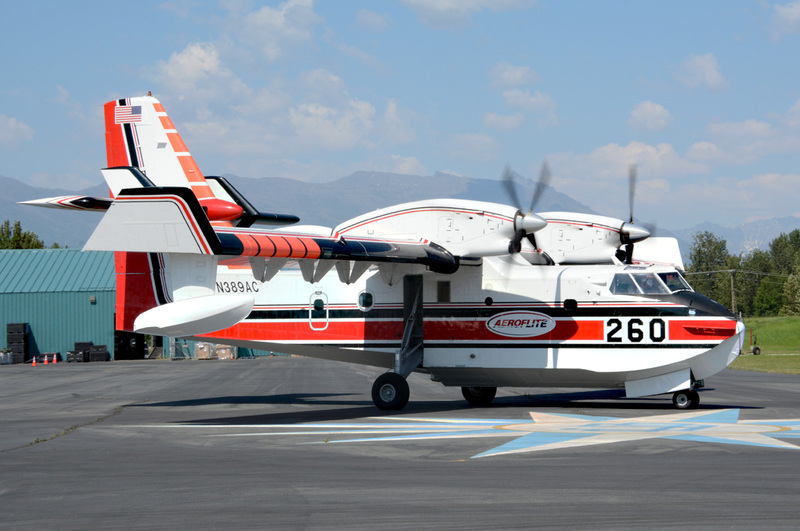 It would soon surpass 7,000 acres in size and attract over 400 firefighters, smokejumpers and aviators to fight it. Some homes and structures had already been lost, with dozens more threatened. It soon earned a serious Type 1 fire status due to its complex nature. 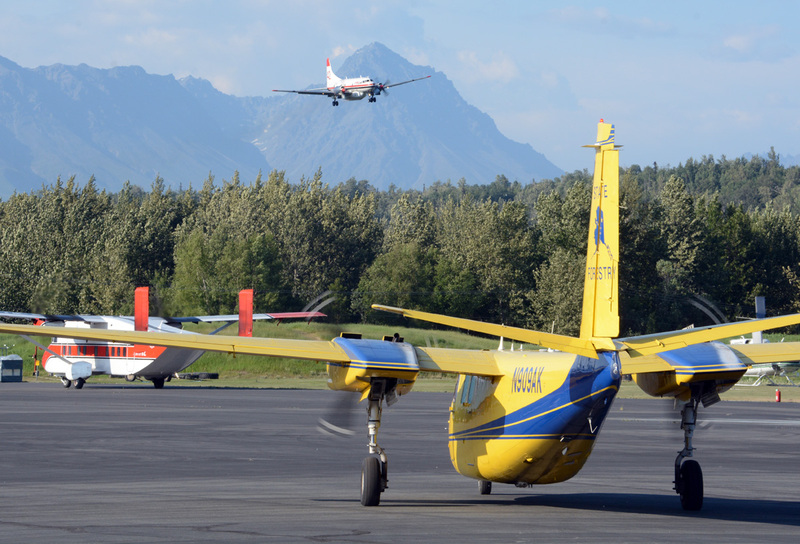 The George Parks Highway, which is the most direct and heavily travelled road between the cities of Anchorage and Fairbanks, was bisected by the fire near Willow; driving restrictions on a 15-mile stretch of the road were in place. Some of Alaska’s prime sled dog country, including part of the famed Iditarod course, was threatened. 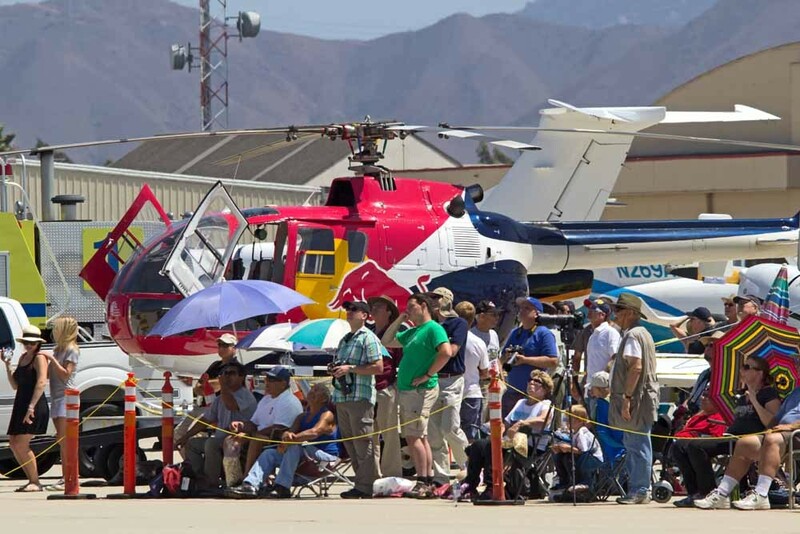 Many dog breeders, mushers, and dogsled enthusiasts quickly gathered their animals and other valuables for evacuation. 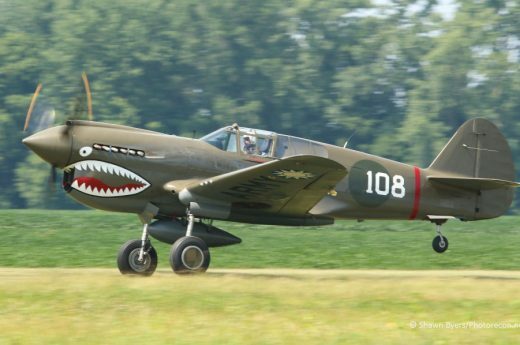 Local aviation – more commonplace than in the Lower 48 – was affected heavily. 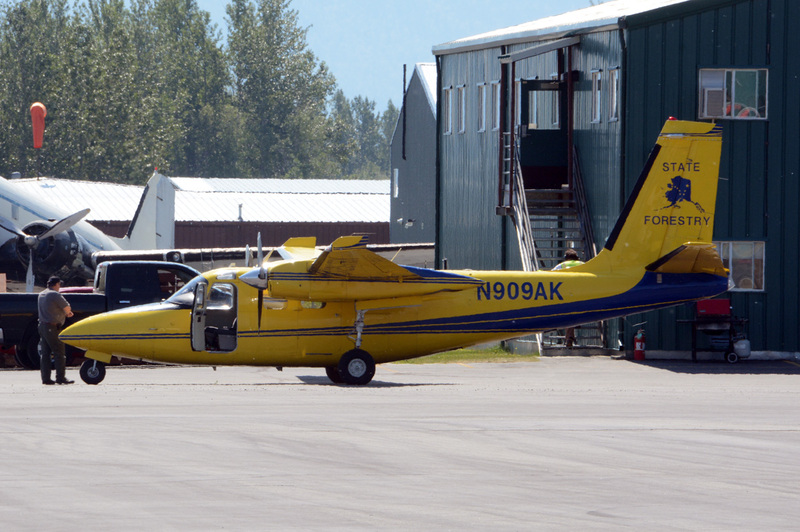 The Willow Airport was used as a firefighting helicopter base; across the street (actually, across the Parks Highway), the Willow Seaplane Base offered a good vantage point to see the advancing fire if one hadn’t already evacuated. 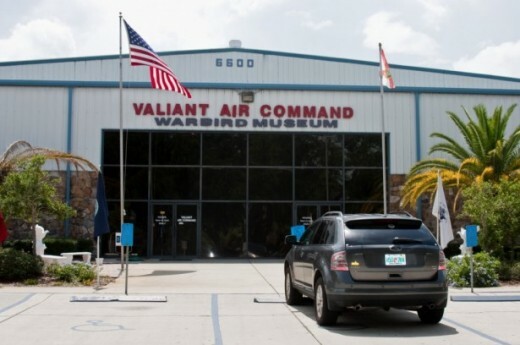 A Temporary Flight Restriction was put into place to allow aircraft “working” the fire to concentrate on their tasks, and unmanned air vehicles – including recreational drones – were grounded near the fire. 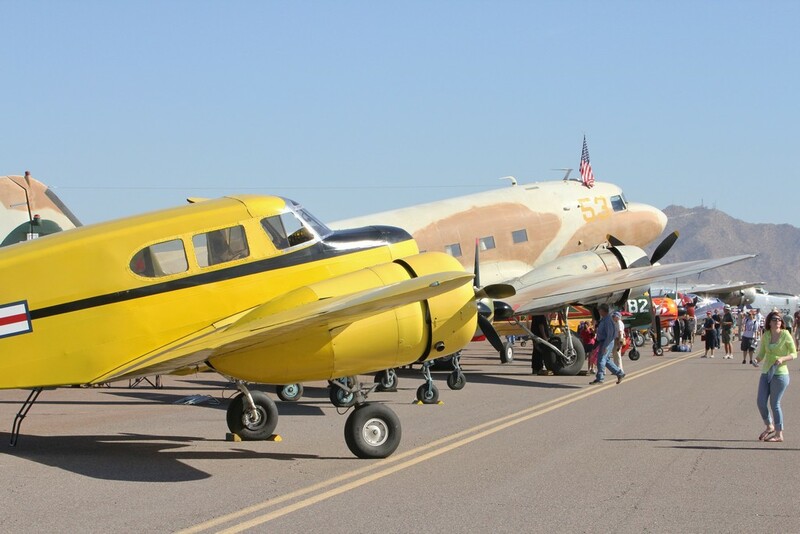 Forty air miles to the east, Palmer airport offered 50 temporary tie downs for aircraft that would be moved from the Willow Airport in case the fire rampaged towards the facility. 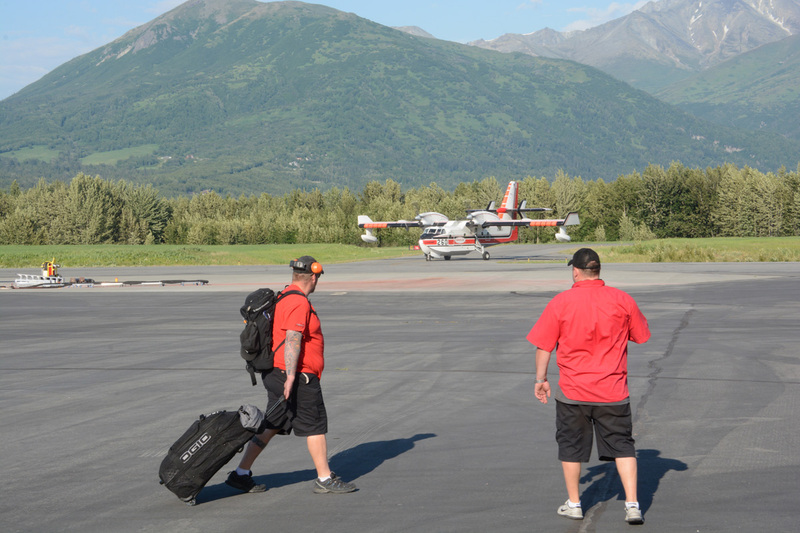 South of Willow (and Anchorage) on the Kenai Peninsula, another fire had broken out in the town of Sterling, named the Card Street Fire. This threatened more buildings and homes, and put great pressure on the area’s sport fishing industry. This fire would also grow to more than 7,000 acres in a few days. 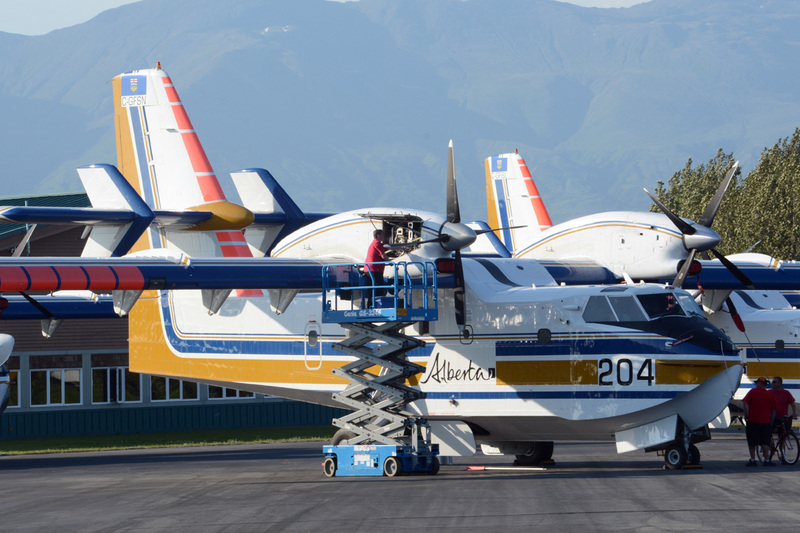 By Wednesday afternoon, three Alaska Forestry “birddog” aircraft – a Shrike Commander and two Turbo Commanders – were joined by four Convair 580 turboprop air tankers, a Canadair CL-415 Super Scooper, and an Avro RJ-85 jet tanker at the Alaskan Department of Forestry air base at Palmer AK. 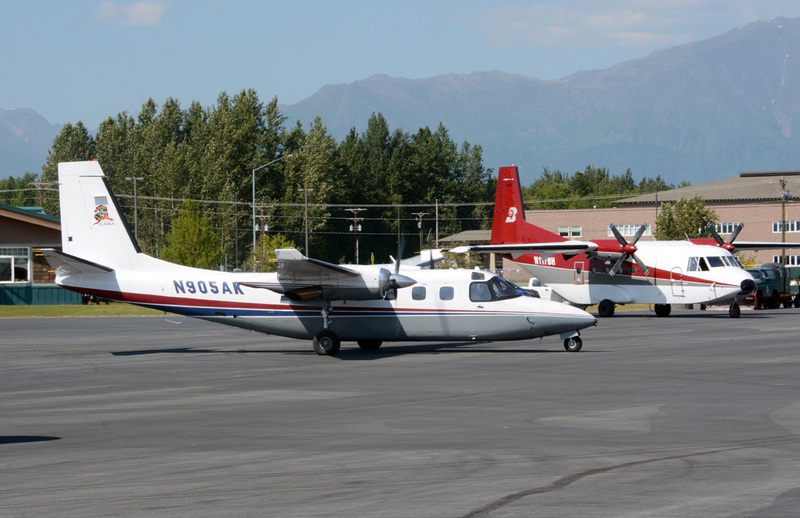 Liaison, personnel transport, and more lead-in/reconnaissance/air attack planes arrived and departed throughout the afternoon… a Kodiak 100, Cessna 208B Caravan, and Shorts SHD-330. 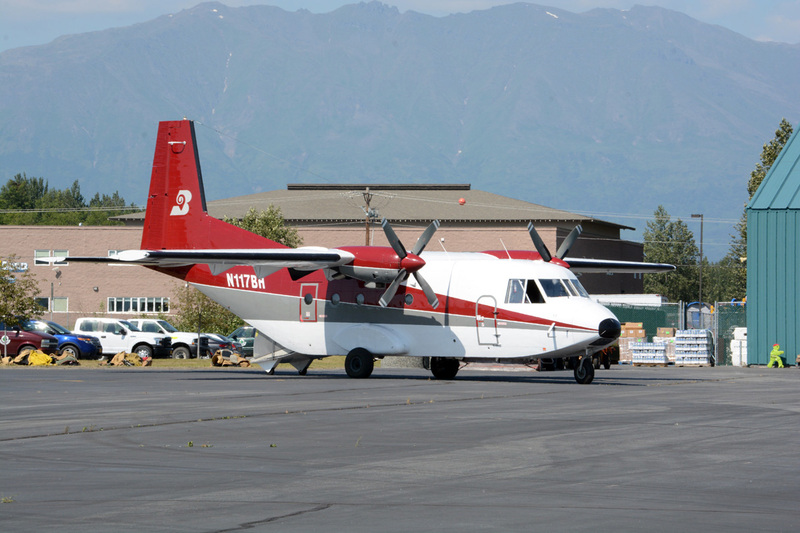 Palmer airport has a water and fire retardant pumping station for airborne firefighting aircraft, as well as hangar and warehouse space for supplies to be utilized during emergencies like the ones now brewing up. 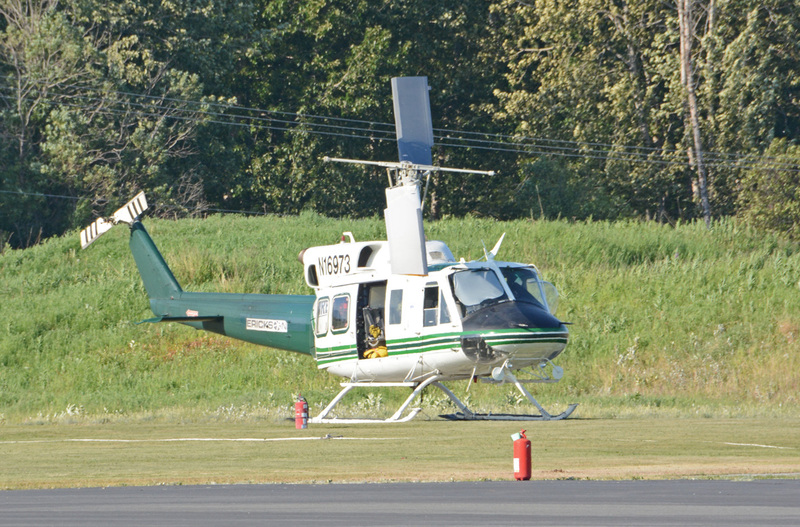 A helitack team from the airport was already working the fire. 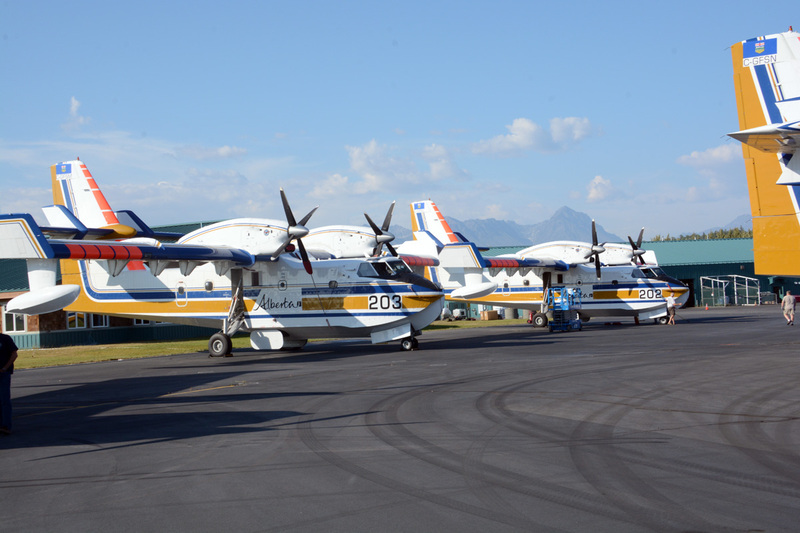 A team of smokejumpers had assembled; they had been active while the Sockeye Fire had grown so fast, and after a break, were in line to be used again when needed. 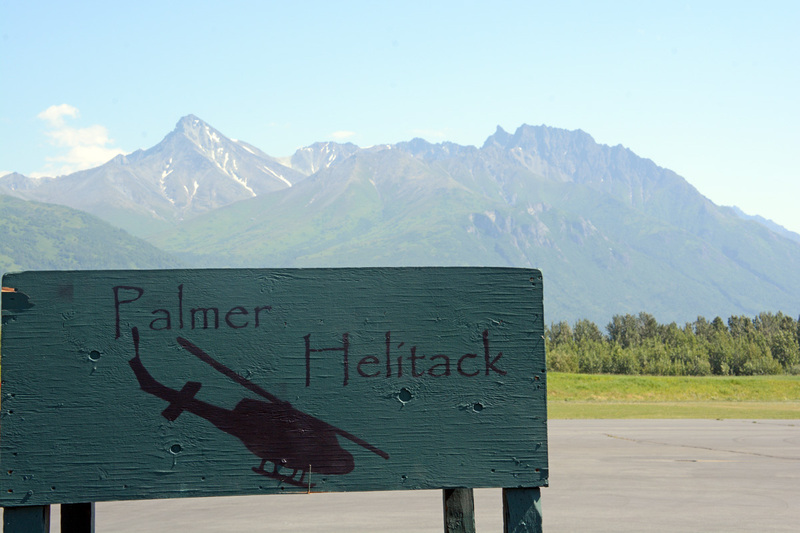 Army National Guard UH-60 helicopters were used on Tuesday too, but hadn’t returned to Palmer. 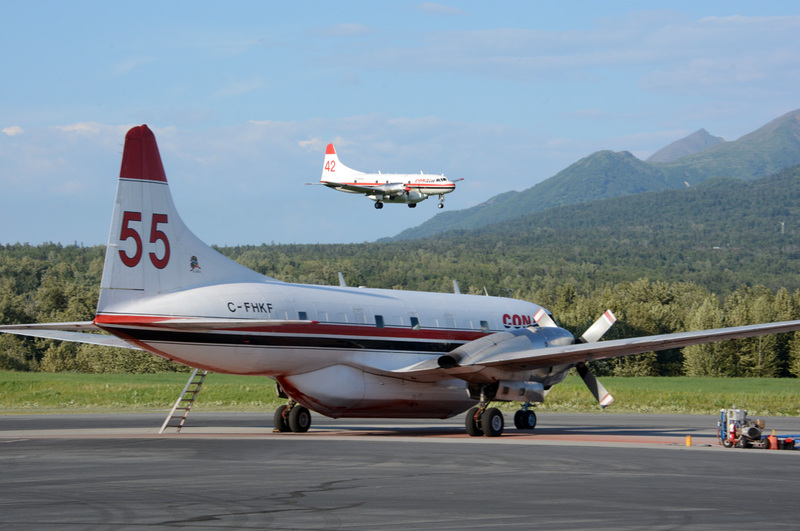 The more southerly Card Street Fire on the Kenai Peninsula attracted the attention of the RJ-85 and a Convair 580 tanker. 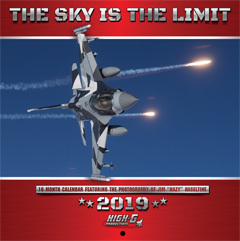 The RJ-85, and other jets such as BAC-146 and MD-87 tankers, are routinely based at a air attack facility at Ladd Army Air Field at Fort Wainwright, near Fairbanks. 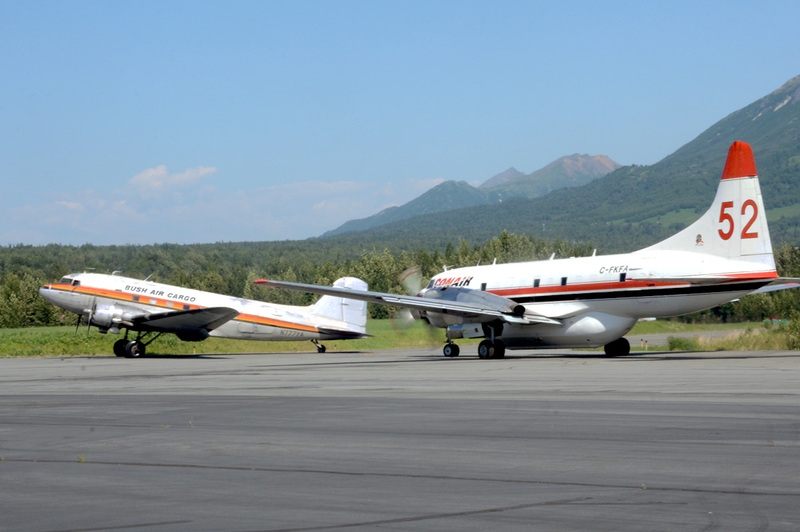 Throughout the fire, different tanker aircraft were shuttled between various airports for fuel, water/retardant refilling, or operational needs. 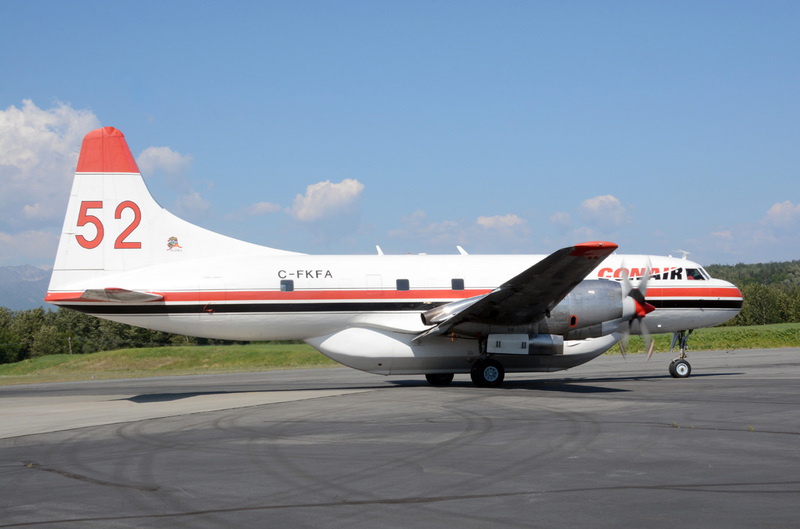 The RJ-85 and Convair that departed continued to different bases later that day. 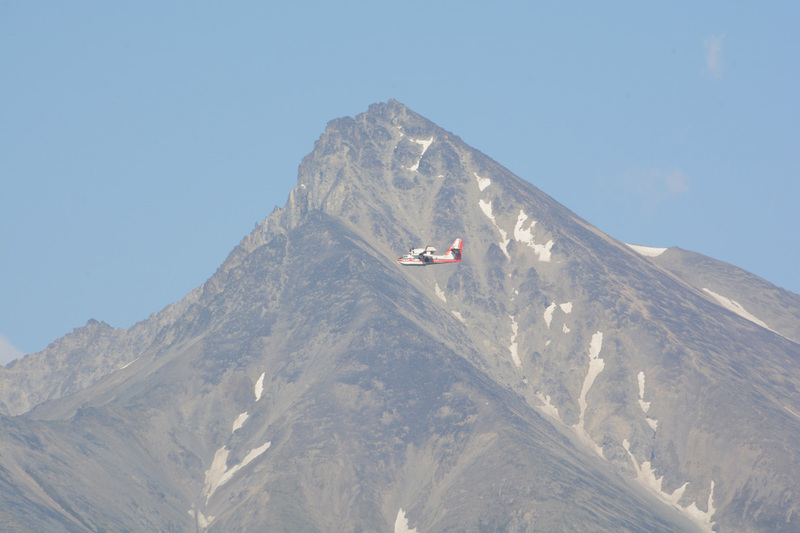 Around 5PM, the crew of smokejumpers was deployed from Palmer too. 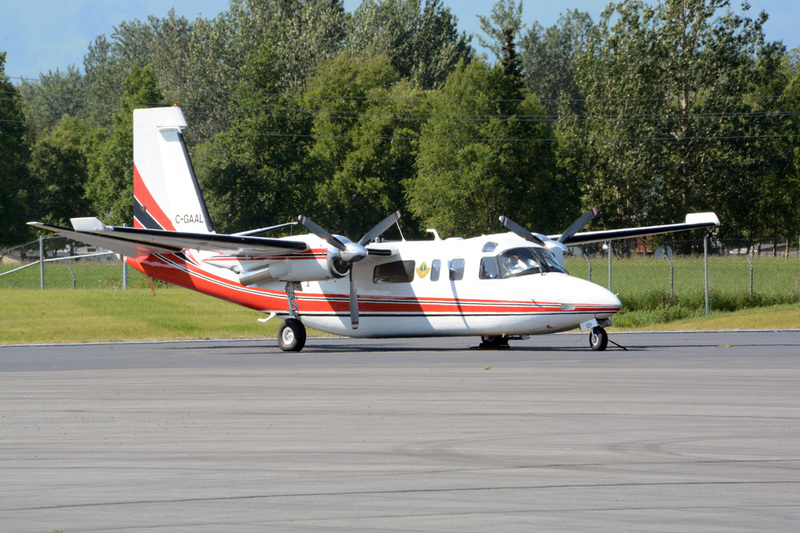 More aerial reinforcements began to arrive in the form of four CL-215T Scoopers, normally operated in Canada’s Alberta Province, and another Convair turboprop from British Columbia. 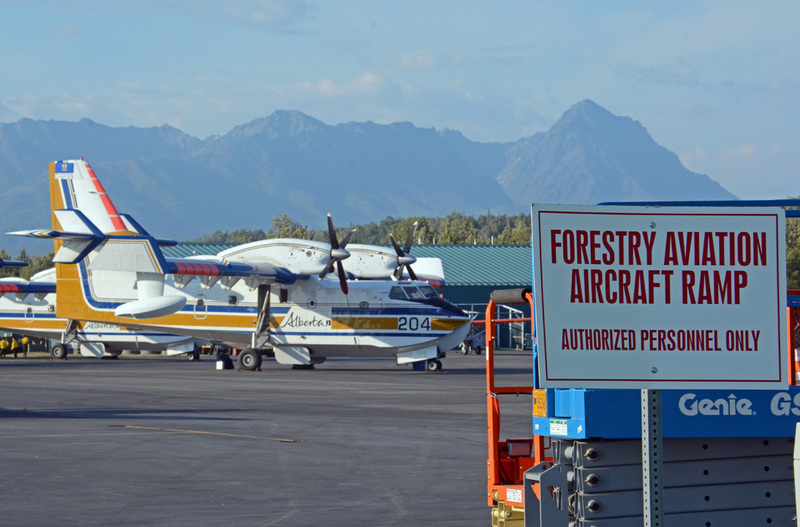 The Canadairs cleared U.S. Customs in Anchorage, and then flew north to Palmer during the early evening. After a night of crew rest and a thorough steam cleaning of their water tanks (to kill invasive species possibly scooped up in other bodies of water), they’d be ready to fight the fires. Before activity increased later in the day, I spoke with a few of the firefighting professionals before they went to work. After gaining approval from the operations supervisor for ramp access, I spoke with Mark, a Wyoming-based Yellowstone Smokejumpers team member. He showed me his team’s eight jump suits that were arrayed on the ground, behind a CASA-212 transport. The smokejumpers wear 85 pounds of extra gear when deploying, including their parachutes, body armor and their fire suit made of Nomex fire retardant fibers. The body armor looks like a football player’s body protection gear, worn under the outer fire suit. Possible contact with trees and/or into landing in unimproved fields necessitate the extra protection. After landing, the armor comes off due to its weight and movement-limiting qualities. Inside the Spanish built CASA 212 were three pallets, tied down on the cargo deck. 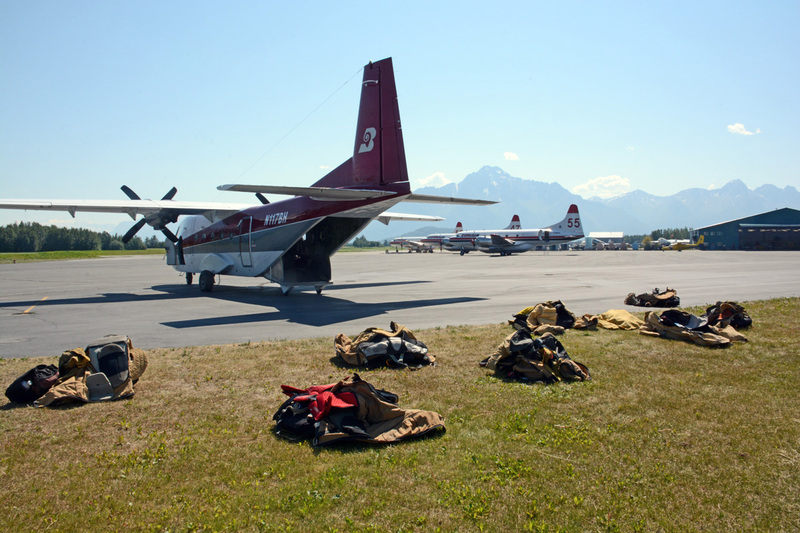 These held the eight smokejumpers’ supplies for three days – food, potable water, firefighting equipment, and other essentials. There was a water pump and hose included, as well as chain saws and hand tools. The team could scramble in 5 minutes time, from startup to being airborne. 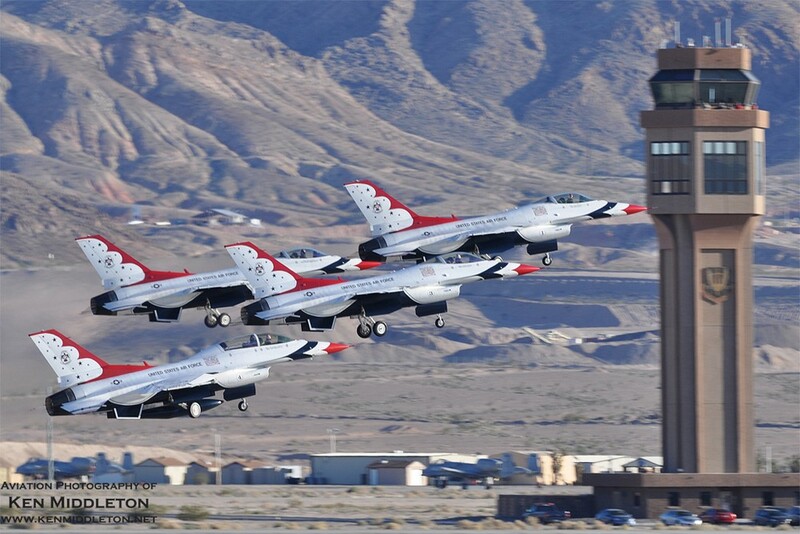 Once near a fire, the pilot would make a pass over a suitable drop zone and a crewmember would toss out colored streamers from 1,500 feet in altitude to check wind velocity and direction. 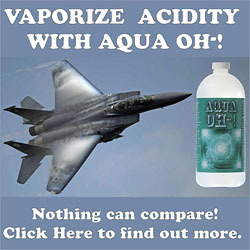 Ultimately, the aircraft would climb to 3,000 feet for the parachute operation. Two jumpers per pass exit the aircraft from the side door behind the wing, stabilized by a small drogue parachute. Five seconds later, you pull your ripcord and check for a good chute. If the chute isn’t effective, a quick cutaway will still allow for a safe landing with your reserve chute. After all 8 to 10 jumpers are on the ground, the aircraft crew would release the three pallets through the rear cargo door, and the waiting firefighters on the ground would recover them and go to work. 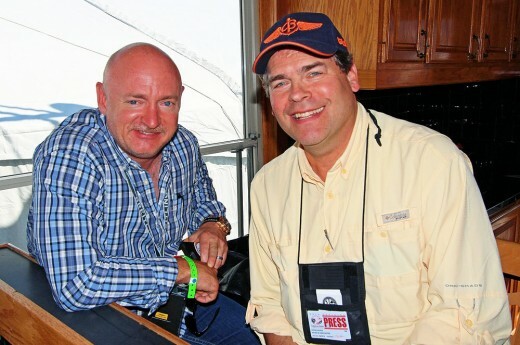 Mark said that he was a firefighter for a long time before becoming a smokejumper. None of his team were parachutists first, and firefighters later…one fought fires first, and got trained on parachuting when you were chosen for the program. 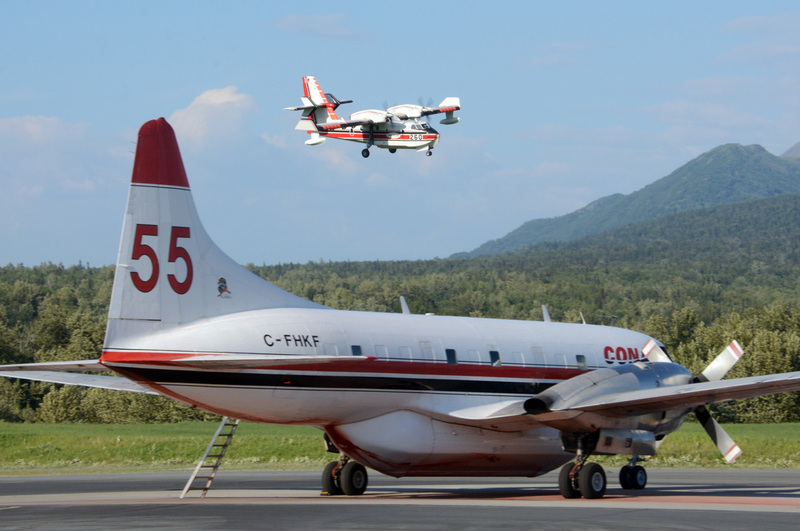 I was lucky enough to speak with numerous tanker/fire bomber pilots and ground crew; the converted Convair 580s were operated by Conair Aerial Firefighting, headquartered in Abbottsford BC. 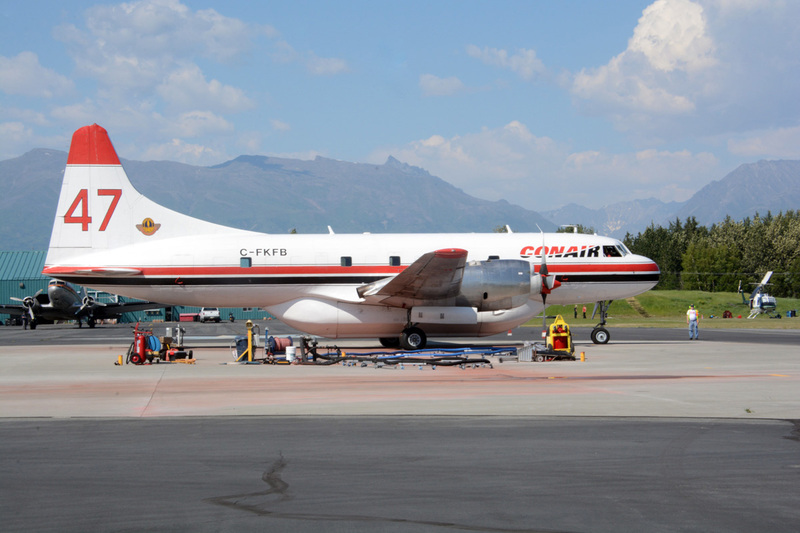 Two of the Convairs were based in Fairbanks during the fire season, the others were called in when the need arose. 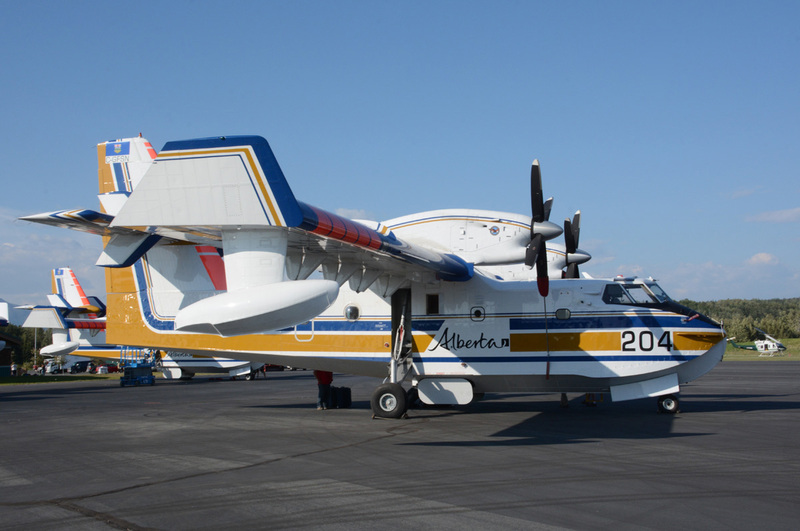 After the Province of Alberta-owned CL-215T Scoopers arrived, the crews exchanged greetings on the ramp… their paths cross on rare occasions throughout the fire season, and this was one of them. There was a large amount of “down time” during the early afternoon, but as soon as the word went out, groups of two aviators and two more ground crew quickly got their Convair aircraft filled with retardant, powered them up, and were ready to depart about 20 minutes later. 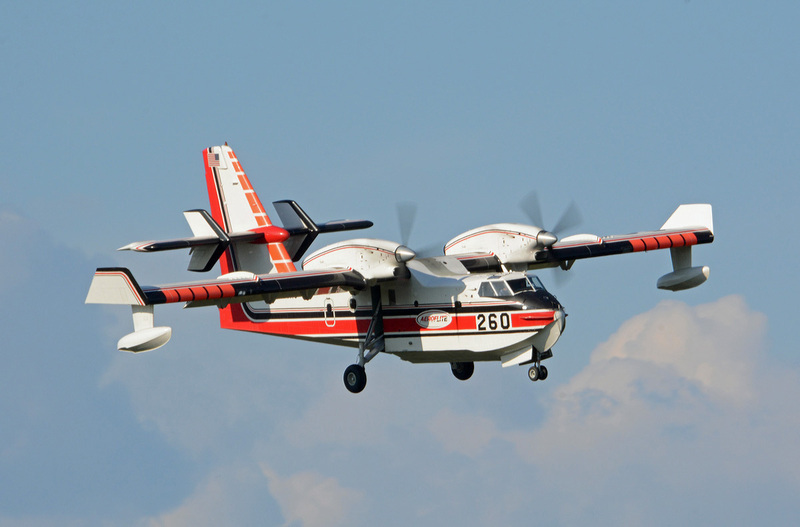 The contrast between the Convair 580s and the Canadair Scooper/Super Scoopers is interesting… the Scoopers can operate closer to many fires as long as there is a ready source of scoopable water (read: lake, pond or river nearby). 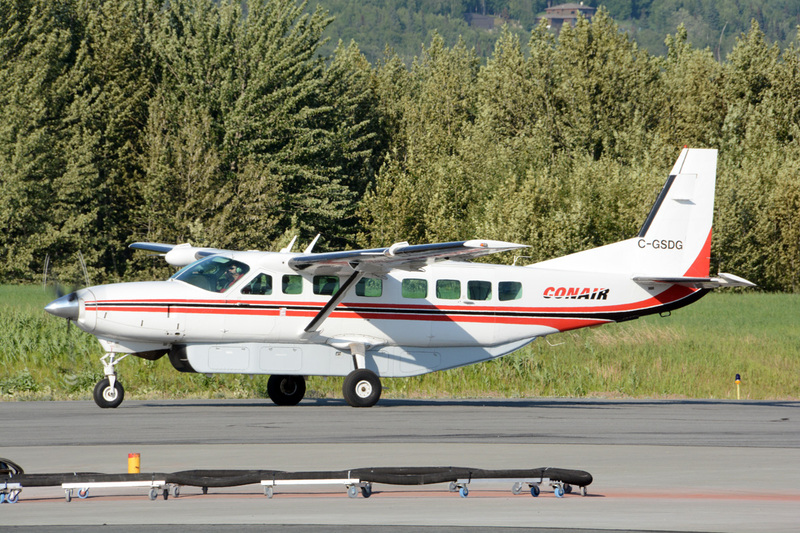 The Convairs need to land and refill after an aerial drop. 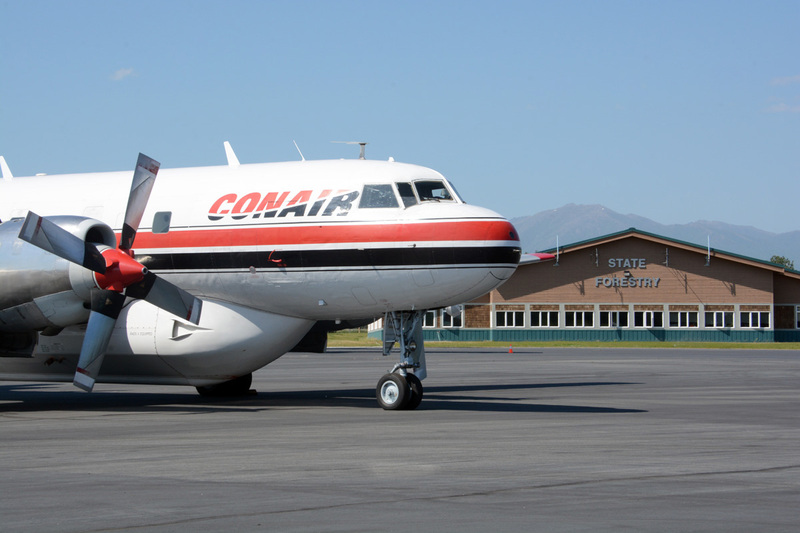 Thus, the Convairs normally are loaded with red-dyed fire retardant stocked at airports while the Canadairs (CL-415 Super Scoopers are newly manufactured airframes, CL-215T Scoopers are remanufactured from earlier piston-engined airframes) drop water most often. There have been experiments when the two types work in tandem… with retardant dropped in front of a fire and water dropped from behind – trying to snuff out the fire while not letting it advance. 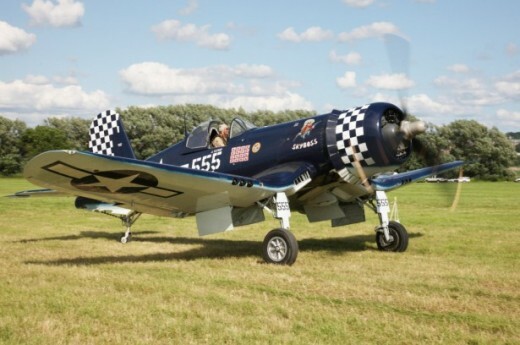 Birddog aircraft normally operate with different types too… as the Turbo Commanders and the Grand Caravan have different operating speeds that better lend themselves to different firebombing aircraft. 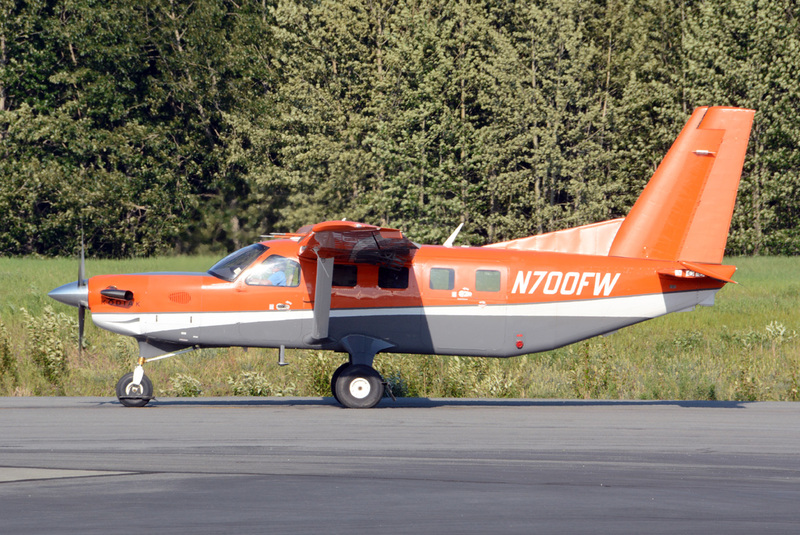 One man who had everything under control while the ramp filled and crews deployed was Dale, the Alaska Department of Natural Resources Division of Forestry Coastal Region Aviation Manager. 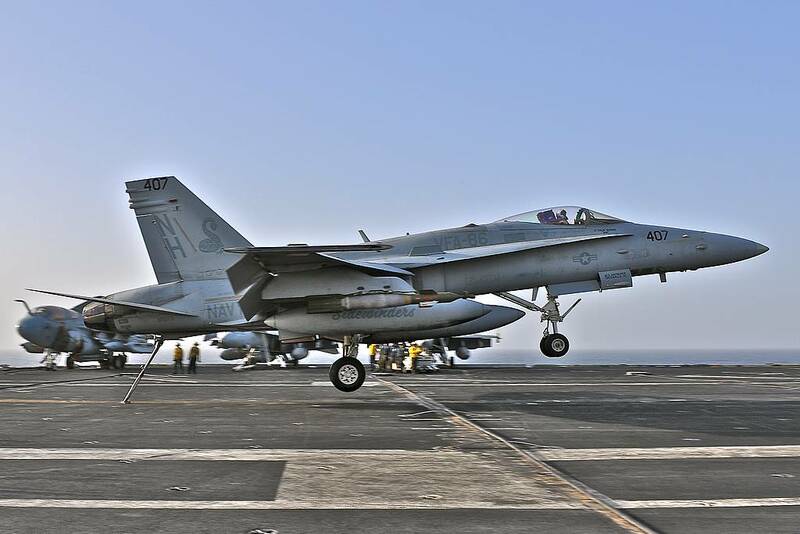 Throughout the afternoon and early evening, he quietly directed the buildup of planes and equipment, as well as personnel. 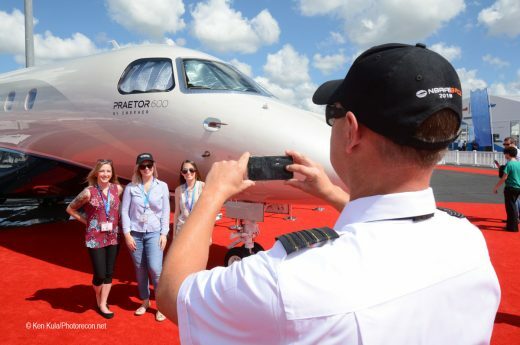 Jet fuel was one element that would be critical, as ten large turbine-powered turboprops and almost a half-dozen smaller aircraft would need to be refueled in the coming days. One staff member relayed to him how many thousands of gallons were already at Palmer, and another truckload would arrive on the next day. Logistics for the firefighters was a main concern at the base, and it sounded like this was a well-oiled machine running in high gear; unfortunately it had been used often during other emergencies. These two wildfires devastated homes, outbuildings and forests. Allegedly started by human hands, the fires made news headlines across the “Lower 48”, as well as in Alaska. 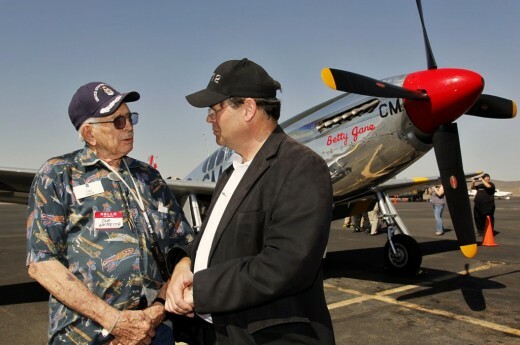 It was an interesting and educational opportunity for me to see from where, and to hear how parts of this aerial attack against these fires would occur. 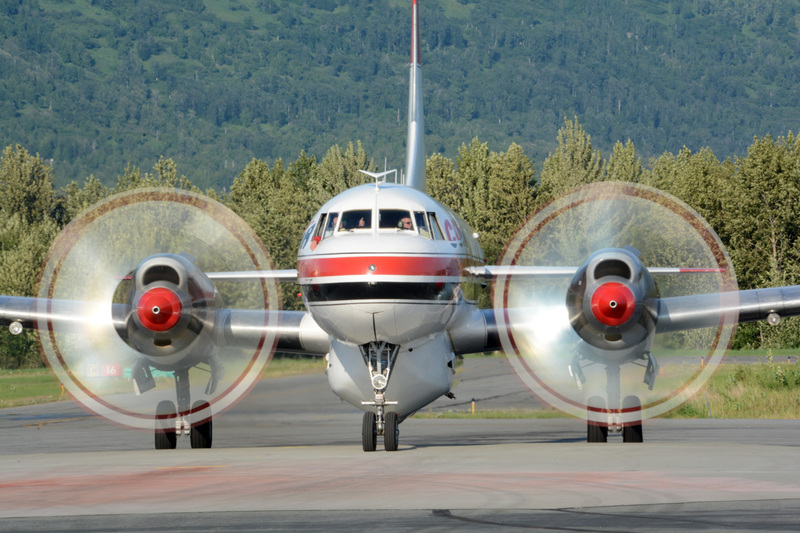 Within a few days, favorable weather and a lot of effort on the part of hundreds of firefighters on the ground and in the air led to the containment of the majority of the Sockeye and Card Street Fires. Seeing a lot of the aerial assets assemble at Palmer’s airport wasn’t an everyday occurrence, but then again, the two fires weren’t either. 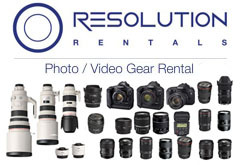 All photos copyright by the author.